I stopped wearing a watch several years ago. I have not found a loss in that yet. It may be that I look at my phone more often, perhaps I’ve placed more clocks around my house. Nevertheless, not wearing time on my wrist has not been a loss for me. I pass this clock all day when I am in the country. It lives in a room filled with windows and somehow, it brings time outside my head, outside my heart. There is something immensely comforting about the meeting of this man made contrivance of time keeping and the cyclical nature of time I witness out my window. 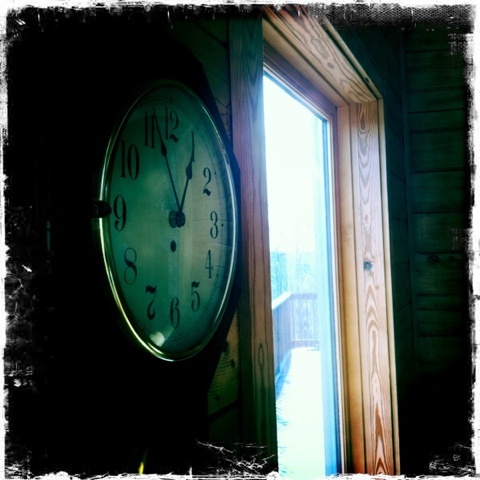 Each, the window and the clock, has it’s turn with call and response…comment and critique. One voice telling the number of the hour, the other voice giving me the details of that number.